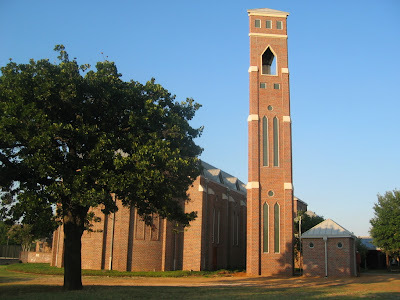 Belying the predictions of some on the Episcopal Left that the prospective departure of the diocese of Fort Worth from TEC would be so highly divisive here as to cause parishes to split chaotically and fall apart, end-of-the-year statistics indicate that our cathedral church, St. Vincent's Church in Bedford, has continued to grow in Average Sunday Attendance over the last year. Our ASA in 2007 will prove to be 410, which marks a 2% increase over our ASA in 2006. In fact, the cathedral's ASA has consistently shown a small increase every year since the Robinson fiasco began in 2003, despite the fact that TEC nationally has experienced massive declines in attendance during that time. We have continued to see new faces at St. Vincent's in the last year. These are people who are looking for traditional Christian worship and teaching. They continue to show up on Sunday mornings, and frequently mention the sound Biblical teaching of the cathedral staff and the staunch defense of Christian orthodoxy by our diocesan leadership as the reasons they have come. Many of them have driven miles to join us to praise God and receive the sacraments in a faithful, orthodox parish. I am aware of no members of the parish who have recently left us on account of our diocese's first vote to sever our ties to the General Convention of the Episcopal church last November. I suspect this is because people who are members of the parish today have already made a conscious decision to be part of a community where "the faith once delivered to the saints" is proclaimed without alteration or compromise. People at St. Vincent's are extremely well-informed about events going on at the national level. We routinely discuss these matters in our Adult Christian Education hour. Most of our parishioners are also quite aware that our pastor, Dean Ryan Reed, is the chairman of the diocesan Standing Committee and is a steadfast supporter of our bishop in the present crisis. In fact, Dean Reed has co-signed many of the strong, faithful statements in defense of the Truth issued by Bishop Iker on behalf of our diocese in the last few years. In short, there can be no doubt that our cathedral church and its clergy stand four-square behind our bishop and we are strongly in favor of ratifying the "separation" amendments to our diocesan constitution that may be finally ratified in 2008. It is clear that the faithful stand of our diocese and cathedral parish in defense of traditional, orthodox Christian doctrine and morals and against the heterodox stands of "the general convention church" has resulted in growth and vitality at St. Vincent's Cathedral, not the division and departures that many on the Episcopal Left had predicted. One further note: There will be some, no doubt, who will point out that the greater Fort Worth area has experienced population growth in recent years and who will speculate that this increase in ASA at St. Vincent's is merely the result of that natural growth. However, population growth alone does not tell the whole story. In fact the population in the area immediately south of the cathedral has changed in such a way as to make our ASA growth in recent years even more remarkable. The demographics of the neighborhoods less than a mile south of our church (the neighborhoods in Hurst, Bedford and Euless immediately south of Pipeline Road) have radically changed over the last decade, becoming increasingly dominated by Spanish-speaking immigrants recently arrived in our area from Mexico. Unfortunately, we do not have the capacity at present to provide Spanish-language services at the cathedral. As a result we have gained few new members from those immigrant-rich areas immediately south of the cathedral in recent years. If we can find a way to reach and serve those new residents of our area more effectively, I am sure our ASA will grow even more rapidly in the future! I have been thinking quite a lot about pictures lately, especially pictures of the Blessed Virgin Mary and Christ our Savior. Of course, these reflections are partly the result of the Madonna-and-Child Christmas cards stacking up on my kitchen table. But I have also been painting just such a picture myself for the last two months. Recently I’ve been spending five or six hours most Saturdays sitting beside a master iconographer and learning how a Byzantine-style icon is “written.” The icon I’ve just finished is a traditional image known as “the Tender Kiss,” where the Christ child is shown reaching up to give His mother a peck on the cheek. Writing this icon has been a marvelous, meditative way to spend Advent and prepare for tonight’s great Feast of the Incarnation of our Lord, the Christ Mass. During the run up to Christmas even our present-day, secular American culture becomes awash in images like this, as the holy Mother and her divine Child grace not only Christmas cards but even shop windows and television ads. Even many of our low-church brothers and sisters, who would be shocked to find an icon or a statue of St. Mary in their places of worship, feel the need to see the events of the Nativity with their own eyes this time of year, setting up manger scenes in front of their churches and adorning their mantles with greeting card images of the Holy Family. We all love to hear the Christmas story each year, but there seems to be something about the birth of our Savior that demands to be seen as well as heard. “And the Word became flesh and dwelt among us, full of grace and truth.” These incomparable words from the beginning of the Gospel according to St. John encapsulate the whole of the Christmas story in one sentence. Tonight we affirm that God the Son, the Essence of the Divine Mind, the sovereign Will through Whom the Universe came into existence, truly God of truly God, begotten of His Father before time and space began, has come down from Heaven and become one of us, eternal Light become flesh and bone, the ethereal become material. But tonight I would also turn our attention to another passage from Holy Scripture--the first chapter of St. Paul’s letter to the Colossians. There Paul tells us that Christ “is the image of the invisible God, the firstborn of all creation. … For in him all the fullness of God was pleased to dwell, and through him to reconcile to himself all things, whether on earth or in heaven, making peace by the blood of his cross.” Note that first phrase: “He is the image of the invisible God.” Here Paul actually uses the Greek word, eikon, or “icon” to describe Christ. He echoes the very words of Jesus on the night He was handed over to suffering and death, “He who has seen me has seen the Father.” In the Incarnation the Divine Word becomes the Divine Icon, the invisible God become visible in human flesh. You know what happens when a portrait that has been painted on a panel becomes obliterated through external stains. The artist does not throw away the panel, but the subject of the portrait has to come and sit for it again, and then the likeness is re-drawn on the same material. Even so it was with the All-holy Son of God. He, the Image of the Father, came and dwelt in our midst, in order that He might renew mankind made after Himself. Thus God the Son was at once both the Supreme Artist and the flawless Model of the divine Image, which our First Parents received at their creation. The One “through whom all things came into being” was born into our world in that stable at Bethlehem so that He might recreate that godly image and likeness within you and me. Thirty years later He would wash us clean by His precious Blood and make our colors as vivid they were in Eden by the power of the Holy Spirit. And because the things of this fallen world had defaced us, God chose the things of this world to restore us—swaddling clothes and an animal’s feed trough, Roman nails and Judean timber, a linen shroud and a rock-hewn tomb. While our salvation no doubt causes joy in Heaven, it is as earthy as that dusty, smelly stable in Bethlehem and the stony soil of Calvary, where the One in whom “the fullness of God dwelt” at His birth made peace “by the blood of His cross,” Yet life, not death, is the climax of the Christmas story. For what began in Bethlehem two thousand years ago was nothing less than the remaking of the world, the ultimate triumph of Light and Life over death and the grave. The wood of the Christmas manger foreshadows not only the tree of Golgotha but the Tree of Life in the New Jerusalem as well. All three are part of the “good news of great joy for all people” announced by the angels, for the Incarnation we celebrate tonight runs like a golden thread through the gospel of our salvation, from our last day in Eden until the Consummation of all things at the End of Days. Of course, Christmas focuses our minds on the Divine Humanity that redeemed the world like no other season. And while theologians have spilled buckets of ink down through the ages on the nature of the unbreakable bond between God and mankind forged in the Incarnation, nothing displays its reality quite like the Bread of Life lying in the straw of a barnyard feed trough. That is also why images of Mother Mary and the infant Jesus captivate us so. The fragility of life at its beginning mirrors that at its end. The Baby in the manger and the Servant-King on His Cross are intimately connected. For the precious Blood that was poured out for the world at Calvary was human blood as well as the Blood of God. The hands that were pierced by Roman spikes for our transgressions had once feebly grasped His Mother’s finger as she cooed to Him in the manger, like any other mother with her baby. The forehead that bled from the crown of thorns had known the Virgin’s tender kiss in the stable of Bethlehem. In short, the Life given up for us in Christ’s atoning sacrifice was a human life very like our own as well as the Source of Life Itself. And the victory the God-man won over death at Easter is a victory in which we, His brothers and sisters by adoption, may share by faith in His name. And that is why “manger scenes” and Christmas pageants and images of Mary and Jesus really do matter. Pictures of our Redeemer and the Blessed Virgin, both shown in all their frail humanity, are a reminder to us that our redemption is not just a fairy tale. It is an established fact of history, as solid as the chalk-covered board on which an icon is painted. When we see the utter dependence of the holy Child upon His mother in such an image, we remember that Jesus Christ—although robed in majesty as the Prince of Heaven--is no mythological figure. He was and is at once both a Man—able to identify with us in all our trials and sorrows and joys--and the God in whose image and likeness we were created. And because of this incomprehensible Truth, the only One who could possibly be our Savior—the only-begotten Son of the Father, the child of Mary of Nazareth, born in the humblest of circumstances-- is in fact our Source of new and unending Life. Glory to God in the Highest, and peace to His people on earth! In the name of the Father and of the Son and of the Holy Spirit. Amen. The Leadership Council of the Common Cause Partnership took the next steps toward a future Anglican union during their meeting over the last two days in Orlando, Florida. They took care of the kind of "housekeeping" that is necessary before much substantive progress can be made on unity, electing officers and ratifying certain documents. While a few people may have been over-enthused about the idea that a new "province" would be announced this week (and hence may be disappointed) in fact the CCP has always been designed as a long-term project. As outlined last September, for example, it is expected to be several more months (at least) before the CCP will even be in a position to hold itself out for recognition by the provinces of the Anglican Communion. And it may be more than a year, apparently, before CCP members are planning a "constitutional convention for an Anglican union." So hold your horses. But things are happening. Festina lente. I note that the communique of the Leadership Council released this evening uses the word "Federation" (with a capital "F") as a synonym for the CCP, and the new website for the CCP uses the phrase "a federation of Anglican Christians in North America" to describe the organization. The introduction to the communique on that website refers to "the Common Cause articles of confederation," and the Leadership Council refers to "the Articles of Federation" as well (apparently referring to this document). As of today that is the "separate ecclesiastical structure” in North America that we have been awaiting--not quite a separate "province" but clearly a "federation" heading toward an "Anglican Union." A good beginning, IMHO. We created the structure called for in the Articles of Federation now adopted by nine of our partners. We elected officers of the Federation and formed an executive committee, as well as other committees and task forces. We have also begun work to harmonize and strengthen our common call to Christian education and mission. We expect these committees and task forces to begin work early in the New Year. We are beginning to explore the expanding possibilities for ecumenical contact with fellow Christians in North America and around the world. Each Common Cause Partner will continue to live out its unique role, maintaining its distinctive ministry and character, noting the provision of the Articles of Federation that "the autonomy of the individual Jurisdictions and Ministries, and their constituent bodies, is in no way restricted or superseded by membership." In the months and years ahead we anticipate a growing number of joint mission initiatives that will strengthen our witness as united and faithful Anglicans in North America. "So in Christ, we who are many, form one body..." (Rom. 12:5). To God be the Glory. UPDATE (Dec. 19th): I spoke this afternoon with a participant in the meeting (a FiFNA representative from our diocese) who said the meeting went well with a very positive spirit. He was quite well pleased. And he was encouraged by the level of cooperation. The main disconnect for me in the Archbishop's letter is this: On the one hand, in reference to TEC's response to the Windsor Report and the Lambeth Resolutions, he acknowledges that "it is extremely unlikely that further meetings will produce any more substantial consensus than that which is now before us." I believe he is correct. TEC is not going to turn back from its present course. It is not going to abide by the consensus of the Anglican Communion on matters of human sexuality. But on the other hand, he then goes on to call for "professionally facilitated conversations between the leadership of The Episcopal Church and those with whom they are most in dispute" in the hope of somehow gaining "a better level of mutual understanding." This hope is in vain. TEC does not negotiate with those with whom they are in dispute; they litigate. Numerous meetings have produced no acceptable solution for the minority to remain with integrity within TEC. The best assistance that the Archbishop can offer to address the situation in TEC is to host a mediation that seeks a negotiated settlement for separation, without rancor or litigation. Bishop Iker: An invitation from Katharine at this point is going to be received as a token gesture and as too little, too late. Also, we must realize that the ground has shifted dramatically, as has the focus of what is to be discussed. A year ago, it was alternative primatial oversight. This was rejected. In March, it was the pastoral scheme from the Primates' Meeting in Dar es Salaam. This too was rejected. Now we are talking about the reality of dioceses separating from TEC and realigning with an orthodox Province. That being the framework for future discussions, I am willing to cooperate with the Archbishop of Canterbury's proposal in his Advent Letter for "professionally facilitated conversations" that will "clarify options" before us. However, we would only enter into such discussions as equal parties with the 815 authorities, not as suppliants petitioning for some form of relief. A negotiated settlement for separation seems to be the best way to proceed. [RWF resumes]: I hope that some people at Lambeth and 815 are listening carefully. No one in Fort Worth wants lengthy and costly litigation. We simply wish to be able to serve Christ as we feel called to do, without compromising the truth. All we ask is to be allowed to depart for an orthodox province of the world-wide Anglican Communion where we can do just that, with minimal interruption to the lives our people and without having to abandon the physical plants that make that service to the Kingdom as efficient and effective as possible. St. Vincent's School, for example, would be utterly destroyed by a victory of Via Media and their 815 overlords should they triumph over the diocese and the parish in court. We could never just "up and move" a school with 230 students to new accommodations. Have these people really thought about exactly what destruction their "replacement strategy" will wreck in the lives of the ordinary Christian people of our diocese if they succeed? Why do they wish to do this terrible thing? We are more than willing to let the three or four parishes [at most] that wish to remain in league with 815 depart in peace. Why cannot they do the same for the 80% or more of us who can no longer remain under PB Schori's authority in good conscience? With God's help and in His name the people of our diocese have built the church buildings and created the ministries that 815 now claims as its own. And the people of our diocese have already spoken once with an overwhelming voice to say that it is time for us to bring our long-dysfunctional relationship to the General Convention of TEC to an end. I have no doubt they will ratify that decision in 2008 in equally resounding numbers. If Archbishop Williams wants to be of service to the faithful Anglicans of North America, let him help us find a way to separate graciously, with minimal rancor and expense, so that we can get back to focusing on winning the world for Christ. Well, almost. I still have to put the "clear coat" finish on the icon of our Savior and the Theotokos that I have been painting for the last two months under the tutelage of master iconographer Jane Ladik. The clear coat finish will be applied later this week, but the painting is done. It turned out far better than I ever would have thought, to be honest, thanks to Jane's excellent instruction and the intervention of the Holy Spirit. To God be the glory! "He is the Image of the invisible God"
I have been thinking quite a lot about pictures of Our Lady and the infant Savior lately. This is partly the result of the Madonna-and-Child Christmas cards stacking up on my kitchen table. But I have also been painting just such a picture myself for the last two months. I have recently spent five or six hours most Saturdays sitting beside a master iconographer and learning how a Byzantine-style icon is “written.” My icon is a traditional image known as “the Tender Kiss,” where the Christ child is shown reaching up to give the Blessed Virgin a peck on the cheek. Writing this icon has been a marvelous, meditative way to spend Advent and prepare for the great Feast of the Incarnation of our Lord, the Christ Mass. It is an incredibly “grounding” experience. And yet there are millions of sincere Christians today who would be uncomfortable with this sort of image. After all, God did command Moses on the Holy Mountain, “You shall not make for yourself a graven image […]. You shall not bow down to them or serve them.” Can we be sure that devotional use of images of Christ is appropriate? During the early Middle Ages some Christians known as the Iconoclasts, raised precisely this objection. They insisted that the Second Commandment forbade the use of images of Christ and the saints as aids to prayer and prohibited devotions such as the veneration of the Holy Cross. Eventually the Iconoclasts convinced some of the Byzantine emperors to begin the systematic destruction of sacred images and the “purification” of Christian worship. Suddenly Christians who maintained the traditional worship practices were persecuted terribly. But soon a champion of the Catholic faith arose, St. John of Damascus. And St. John’s answer to the Iconoclasts was startling. Of course the Second Commandment forbids idolatry, he said. But we must never forget that the Incarnation and the saving work of Christ on the Cross have altered the world forever. The physical world has been sanctified to an unimaginable degree because God Himself became a part of it, living and dying as one of us. The Creator is separate from His creation, John insisted, but in the Incarnation God has also identified Himself with the created order. Therefore, after the coming of God the Son in the flesh the use of material things in our worship of Him is more than appropriate. It is demanded. You see, “materiality” and salvation are intimately linked. The Christian faith is not just about “ideas.” For, my brothers and sisters, the pagans have their mythology. Philosophers and scientist have their theories. But you and I, as the people of God, have the facts of history. Our faith relates entirely to the real world and the God who made. For the one true God, whom we worship, is not an abstraction. He is the Maker of all that is, visible and invisible. The Lamb of God, who gave Himself up for us on that terrible, yet “Good” Friday, is not a “redeemer myth” or “literary trope.” The flesh and blood man, Jesus of Nazareth—very God of very God come down from Heaven, saved us by the most mundane things imaginable: bone-studded leather whips, the spittle of Roman executioners, eight-inch long iron spikes, and a couple of rough-hewn pieces of wood. And from that despicable assemblage of material stuff, at one particular place and one particular time—outside the walls of a mid-sized town in a remote province at three o’clock on a Friday afternoon—our Lord Jesus Christ crushed the power of sin and death and gave birth to a new creation. For that day at the Place of the Skull the Lord God Incarnate took upon Himself every sin committed by the human race--from that last dawn in Eden until the End of Days--as “He stretched out His arms of love on the hard wood of the cross.” All the suffering that sin has inflicted upon mankind since the Fall--every broken heart, every ache and pain, every tear shed at every graveside—our Lord Jesus offered all of them up in His own flesh as His perfect, atoning sacrifice to God the Father. Because Christ was lifted up on that rough-hewn Roman cross, there is no pain we can suffer that our God has not already shared and there is no trespass we may commit beyond the forgiveness of the One who knew no sin, yet became sin for us. And as those two unobtrusive pieces of Roman wood soaked in our Savior’s precious Blood, they became the Tree of Life for all those who have repented of their sin, placed their trust in Christ, and been buried with Him in the waters of baptism. Salvation for the Christian is a solid fact of history. Its results are material and palpable as well as spiritual and eternal. Without the Incarnation, of course, none of that would have been possible. Christmas focuses our minds on that the Divine Humanity that redeemed the world. And while theologians have spilled buckets of ink down through the ages on the nature of the inextricable link between God and us forged in the Incarnation, nothing displays its reality quite like the Bread of Life lying in the straw of a barnyard’s food trough. That is also why images of Mother Mary and the infant Jesus captivate us so. The fragility of life at its beginning mirrors that at its end. The Baby in the manger and the King on His Cross are intimately connected. For the precious Blood that was poured out for the world at Calvary was human blood as well as the Blood of God. The hands that were pierced by those Roman spikes had once feebly grasped His Mother’s finger as she cooed to Him, like any other mother with her baby. The forehead that bled from the crown of thorns had known the Virgin’s tender kiss in the stable of Bethlehem. The Life given up for us in Christ’s atoning sacrifice was, in short, a human life very like our own as well as the source of Life Itself. This is a fun page to visit. Take a short quiz and find out which Church Father you most closely resemble. Hat tip to Theology of the Body. 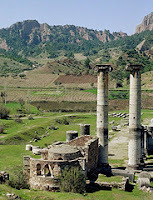 The image above is of the ancient site of Sardis. Another major development in North American Anglicanism took place this weekend in Virginia. Four new bishops, including two Americans, were consecrated bishops for CANA. The principal consecrator was Archbishop Akinola of Nigeria, but Bishop Duncan of Pittsburgh (moderator of the Network), Bishop Frank Lyons of the Province of the Southern Cone, Bishop John Guernsey, Missionary Bishop for the Province of Uganda, and Bishop John Ball, Diocese of Chelmsford, Church of England, as well as Bishop Kwashi of Nigeria also took part. That is the Common Cause Partnership in action! Baby Blue has the full story, with video. Diocese of San Joaquin Is Out of TEC! "The Episcopal Church receives with sadness the news that some members of this church have made a decision to leave this church," said Presiding Bishop Katharine Jefferts Schori. "We deeply regret their unwillingness or inability to live within the historical Anglican understanding of comprehensiveness. We wish them to know of our prayers for them and their journey. The Episcopal Church will continue in the Diocese of San Joaquin, albeit with new leadership." Bishop John-David Schofield of San Joaquin has replied to the Presiding Bishop's letter of yesterday. The good bishop is as clear as he can be. Below is the full text, with highlights added by me. The letter was first posted at Stand Firm. Greetings in the name of Jesus Christ, our one and only Lord and Savior. I have read your letter of December 3, 2007 and thank you for your prayers. There is a pastoral tone to this letter which is much appreciated. Informing me that you are not writing with any threats is most encouraging also. One would hope that this indicates your serious consideration of the Primates’ specific request that deposition and litigation under the present circumstances be abandoned as unacceptable behavior among Christians. Please know I do not share your feelings that I am isolated. My understanding of the authority of the Holy Scriptures, as well as Catholic Faith and Order are shared by the Roman Catholic Church, Eastern Orthodox Churches and by some 60 million faithful Anglicans worldwide. It is The Episcopal Church that has isolated itself from the overwhelming majority of Christendom and more specifically from the Anglican Communion by denying Biblical truth and walking apart from the historic Faith and Order. It is true that the House of Bishops has ignored my views for nearly twenty years. After this length of time, one wonders how genuine the offer of change for the Church can be by having the "loyal opposition" present at the table. Despite all of this, we are not pining away here in the Diocese of San Joaquin; we are rejoicing in the truth of God’s word! The decision to be made by our Annual Convention this Saturday is the culmination of The Episcopal Church’s failure to heed the repeated calls for repentance issued by the Primates of the Anglican Communion and for the cessation of false teaching and sacramental actions explicitly contrary to Scripture. For years, I have tried in vain to obtain adequate Primatial oversight to protect the Diocese from an apostate institution that has minted a new religion irreconcilable with the Anglican faith. Hopes were raised in February 2007 when leaders of the Anglican Communion met in Dar es Salaam. The direction given by them for the formation of a pastoral council would have provided the protection we requested and would have averted the need for the Diocese to seek sanctuary from another Province. You were in Dar es Salaam, and in the presence of the assembled Primates you verbally signified your agreement to this direction. By the time you returned to the United States, however, you denied your public statement and declared you had only meant to bring it back for further consideration. It was no surprise, therefore, when the Executive Council and the House of Bishops of The Episcopal Church later denounced the plan for a pastoral council that you went along with them. This was a clear signal that our religious freedom to practice the Historic Faith as this Church has received it would not be protected by The Episcopal Church. My Ordination vows require me to be a faithful steward of God’s holy Word and to defend His truth and "be ready, with all faithful diligence, to banish and drive away from the Church all erroneous and strange doctrines contrary to God’s Word; and to use both public and private monitions and exhortations..." I can do no other. The Anglican Church of the Southern Cone has graciously offered the Diocese sanctuary on a temporary and emergency basis. This action is unprecedented but so, too, are the apostate actions of The Episcopal Church that make these protective measures necessary. The invitation of the Southern Cone is a matter of public record. In essence it embodies the solution agreed upon by you and the rest of the Anglican leaders at Dar es Salaam to provide adequate, acceptable Alternative Primatial Oversight. To endorse this as a way forward need not be a final nor irreconcilable commitment. Should it be the will of the Annual Convention to accept this most generous gift, I will welcome the opportunity implied in your letter to discuss how it impacts our relationship. In the event that the clergy and laity reject this offer from the Southern Cone, I would, of course, follow your recommendation to participate as a dissenter of the present unbiblical course of action being pursued by the House of Bishops. To do anything else would be to abandon God’s people of San Joaquin and, in the end, prove to be a hireling and not a shepherd. For me, at least, this is the honorable course the Lord would have me follow. EXTRA: There is a relatively unbiased news story on the issue here. A few weeks ago Presiding Bishop Schori issued threatening letters to Bishop Duncan of Pittsburgh and Bishop Iker of Fort Worth, threatening them with deposition if their diocesan conventions acted to pass first readings on constitutional amendments that would end their accession to the General Convention of the Episcopal Church. Now she has written Bishop Schofield of San Joaquin, California in a similar vein. Charming. (Emphasis added by RWF--you simply have to love the fact that PB Schori has now developed such a strong attachment to the "long-standing principles of catholic Christianity.") The full letter, along with another ENS story explaining the line of attack the national headquarters will take if they pass the amendment in its final reading, may be found here. As you approach your next Diocesan Convention, I would like to remind you of my prayers, and those of many other Episcopalians, for you and for the Diocese of San Joaquin. I continue to be concerned for your health, and for your evident sense of isolation. You have been clear that you feel your views are dismissed or ignored within the Episcopal Church, yet you have ceased to participate in the councils of the Church. It is difficult to have dialogue with one who is absent. While there are a number who disagree with you, I believe many more would welcome your participation, particularly as a sign of your faithfulness to your vow to share in the councils of the Church. The Church will never change if dissenters withdraw from the table. There is an ancient and honored tradition of loyal opposition, and many would welcome your participation. I do not need to remind you as well of the potential consequences of the direction in which you appear to be leading the Diocese of San Joaquin. In this connection I have in mind, among other things, your support of amendments to that diocese's Constitution that would be plainly inconsistent with the Constitution of the Episcopal Church and that would implicitly reject the Church's property and other canons, as well as your support for the transfer of the membership of your Diocese to the Province of the Southern Cone. If you continue along this path, I believe it will be necessary to ascertain whether you have in fact abandoned the communion of this Church, and violated your vows to uphold the doctrine, discipline, and worship of this Church. I do not intend to threaten you, only to urge you to reconsider and draw back from this trajectory. While you may believe that the Diocese of San Joaquin can be welcomed into another Province of the Anglican Communion, I believe you will find that few parts of the Communion will recognize such a proposal. Such an action is without precedent, violates long-standing principles of catholic Christianity, and can only harm those faithful Episcopalians who only seek to follow Christ. I urge you to consider whether there might not be a more honorable course for you, personally, than seeking to violate your ordination vows and the Canons of this Church. Together with many in this Church, I would very much value your continued and increased presence at the table – both the table of Jesus Christ and the table of fellowship. If you need a little comic relief after reading that letter, check out this little gem from Stand Firm.